The best travel companion you could ever ask for, the recently launched Audi A8 sprints with a finesse that turns heads. Endowed with a sleek silhouette, which flows elegantly from its HD Matrix LED headlights (consisting of 32 LEDs lit according to what the front camera detects) to its twin rear OLED lights and single-band rear light, this sporty steed comes in the long wheelbase form in Singapore, at 5.4m long. An undeniable shift in Audi design aside, the A8 also heralds a new era for smart technology and intuitive features. 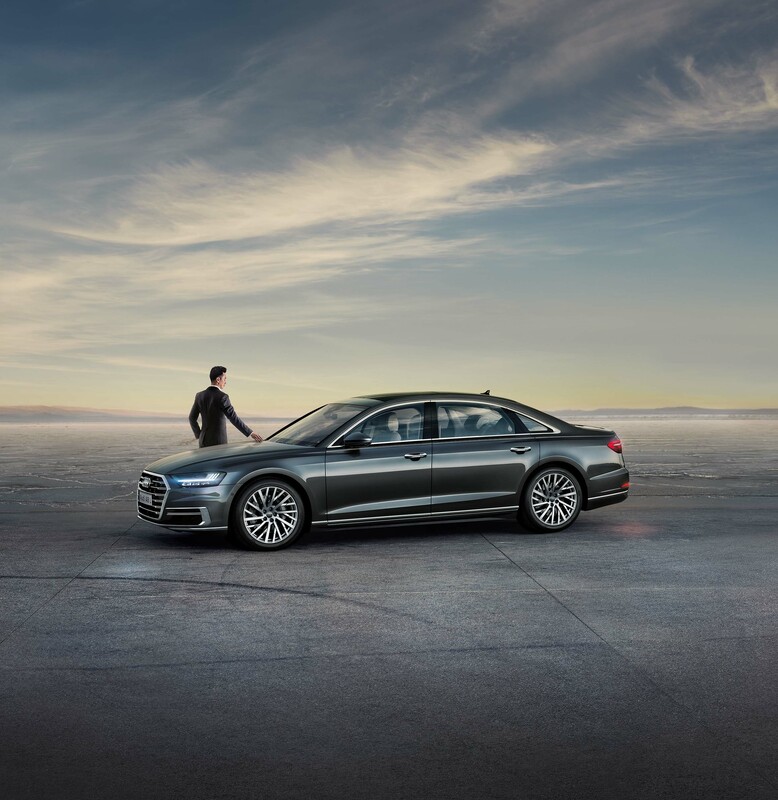 The A8’s predictive safety system acts as its driver’s “spider-sense”, if you will, when turning, reversing as well as at intersections — and, as shown in Audi commercials, avoiding collisions with pedestrians, cyclists and other vehicles. You can even hold a simple conversation with this veritable Knight Rider, which not only understands voice commands and takes instructions via its user-friendly touchscreen interface, but also assists you in accelerating, braking, maintaining speed and distance, and lane guidance and steering. Enter its futuristic cockpit and into a spacious driving experience that’s accentuated by a wraparound console, elegant trims and wooden details. Above a newly designed, intricately finished steering wheel, a full digital 12.3-inch Audi virtual cockpit replaces the traditional analogue display, presenting relevant information to you however you want it. While 10.1-inch and 8.6-inch screens on the central console are easily controlled with gentle touches, you can even write instructions on these panels, which are programmed to interpret different styles of handwriting. Besides a smart ventilation system, Bang & Olufsen Premium Sound System and gentle ambient lighting, the luxurious creature comforts the A8 proffers even include back and foot massage functions. An intricately stitched leather armrest with cupholder unfolds in the rear seat, brandishing a detachable rear seat remote. The Audi rear seat remote is a 5.7-inch full HD OLED display that controls all comfort and infotainment seat functions. This multi-faceted smart driving system constantly communicates with the highly efficient 3.0 V6 TFSI gasoline engine, which supplies 250 kW (340 hp). This translates to the A8 L sprinting from standstill to 100 km/h in 5.7 seconds, while it consumes only 8.2 litres of fuel per 100km. Take this feat of modern engineering for a spin to enjoy a luxuriously comfortable and intuitive ride like no other.